Mexico’s newly installed president faces a tough first year in office as he struggles to reconcile his promises with fiscal reality. Corn tortillas are a basic staple in Mexicans’ diet. But for the administration of the country’s new president, Felipe Calderón, who was inaugurated in December, tortillas served as a trigger for a major political reality check. When tortilla prices spiked sharply, protesters took to the streets, handing the president his first political crisis and reminding him that creating jobs and alleviating poverty must remain at the top of his agenda. Unequal wealth distribution, even as the country experiences an oil windfall, nearly cost Calderón the presidency: He won by a meager 0.6% margin last July over former Mexico City mayor Andrés Manuel López Obrador. Calderón’s opponent was a populist who appealed to the nation’s poor, while Calderón developed a following among the business community. Food prices are particularly sensitive in a country where 50% of the population lives in poverty and the minimum wage is $4.50 per day. “For Mexico, there is no left versus right; it is a question of the past versus the future,” Calderón said at the World Economic Forum annual meeting in Davos, Switzerland, in January. The president identified upholding legal institutions, ensuring public security, boosting competitiveness, improving healthcare and increasing environmental protection as his administration’s priorities. The tortilla situation, coupled with a drop in consumer confidence between December and January to its lowest level in 14 months, however, forced the president to take emergency measures that would be more in line with those of his opponents, particularly ahead of the 2009 mid-term legislative elections. Besides authorizing an increase in duty-free imports of corn to ease the tortilla crisis, the president in January launched a program that grants cash incentives to companies that hire first-time job holders, with the government making social security and healthcare contributions for one year. “Employment is the biggest door to overcome poverty,” Calderón said as he signed the new jobs program, for which the government allocated an estimated $300 million. “To move Mexico forward, we have to create more and better jobs,” he added. Unemployment remained flat in 2006 from 2005, at 3.6%, with 880,000 jobs created last year. The figure is insufficient to handle the 1 million young Mexicans that enter the workforce each year, for which the president’s strategy was welcomed as a step in the right direction. “Instead of labor leaving to go where there is capital, we should be bringing the capital to where the labor force is,” said labor secretary Javier Lozano, a lawyer and former deputy secretary of transportation and communications, who vows to respect labor unions while working with legislators on labor reforms that will create jobs, boost economic growth and curb illegal migration. The 2007 budget calls for incentives to labor-intensive sectors, including agriculture and tourism. Yet Calderón may be headed for some friction with the business sector that supported his presidential race. A World Bank study published last year showed the net worth of Mexican billionaires rose to 6% of GDP in 2006 from 4% in 2000, driven by strong corporate earnings and hefty stock market gains. With a net worth of around $30 billion, Mexican tycoon Carlos Slim now ranks as the world’s third-richest man. 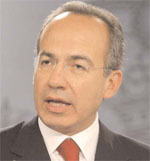 The study noted that much of this wealth has been amassed through monopolies that Calderón vows to disband. In the case of corn tortillas, food processor Gruma controls 70% of Mexico’s tortilla and cornmeal market. “Public and private monopolies dominate the country,” former foreign minister Jorge Castañeda said in a press interview in December. Castañeda, now a professor of politics and Latin American Studies at New York University, warned that “prices, supply, service and quality suffer as a consequence, and today these monopolies are stronger than ever.” The government has boosted investigations by its anti-trust authorities into such monopolies, although no high-profile action has yet been taken. Adding further potential tensions is a recently approved tax reform bill that reduces VAT exemptions, eliminates certain loopholes on corporate taxes and seeks to crack down on tax evasion. Taxes stand at about 11% of Mexican GDP, although Mexico has the second-lowest tax collection rate in Latin America, second only to Haiti. The business sector’s tolerance of such measures will depend on the vibrancy of the nation’s economy throughout Calderón’s six-year term. His predecessor, Vicente Fox, pledged to spark 7% annual growth when he took office in 2000, but the economy grew by an average of only 1.8% between 2000 and 2006. Last year, oil prices helped boost the economy by 4.7%, the highest growth rate since 2000. The government predicts 3.6% growth for 2007. “For 2007, we are looking at weaker growth because of a slowdown in the United States’ economy, especially in the first part of the year,” says Mexico’s central bank governor Guillermo Ortiz. The 2007 budget contemplates a 3% inflation rate, though core inflation set a 21-month high in December 2006 at 3.6%. The budget predicts short-term interest rates at 6.8%. 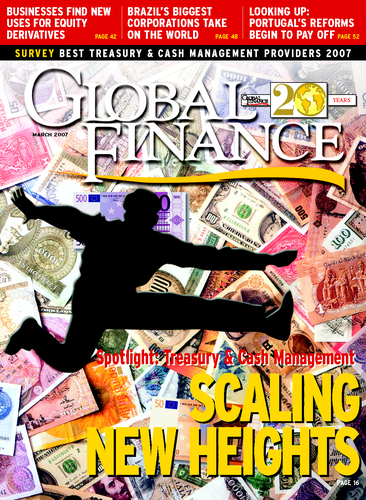 The central bank kept the benchmark interest rate unchanged in January at 7% for the ninth consecutive month, with recent price hikes for basic food items, including tortillas, prompting analysts to reverse initial predictions of a rate cut in early 2007 and prompting some to forecast a possible rate hike to curb inflation. Among the government’s concerns on the economic front is how far oil prices will fall this year, as oil accounts for more than one-third of the country’s fiscal revenues. While Mexico’s 2007 budget is based on an average price of $42.50 per barrel for its basket of exported oil, the price had already dropped to $41.95 on January 11, introducing the possibility of a budget adjustment. The government’s new oil income stabilization fund to offset price drops, which stood at $6.2 billion at the end of 2006, will provide a cushion and could help stave off any unpopular spending cuts, although any sharp price drops will likely heighten calls to accelerate fiscal reforms to reduce the dependence on oil revenues. Meanwhile, the president introduced austerity measures that include a 10% cut in salaries for high-level government officials, including his own, which should save as much as $2.3 billion this year.